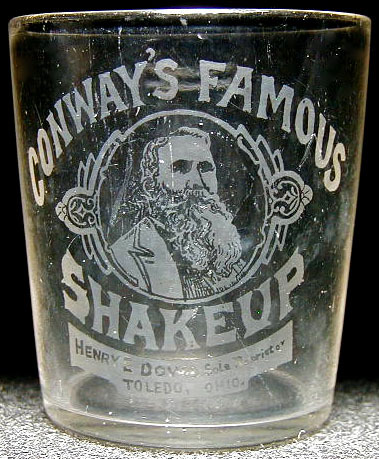 Inscription: CONWAY'S FAMOUS (arched) / (head-and-shoulders portrait of a bearded man within an embellished, frosted, oval outline) / SHAKEUP (reverse arched) / HENRY E. DOWD Sole Proprietor / TOLEDO, OHIO. (both lines tsp on a reverse arched frosted panel). Dimensions: 2-9/16" x 2-5/16" x 1-7/8"